An Gleantain Cottages are ideally located in pretty Caherdaniel village, on the Ring of Kerry, these beautiful self catering cottages are ideal for holidaying in Kerry. Each detached holiday home is tastefully decorated and offers wonderful spacious accommodation. There are 4 bedrooms accommodating up to 8 people, 2 double rooms and 2 twin rooms. These houses are at the front of the complex opposite the school. Caherdaniel is a wonderful base from which to explore the Ring of Kerry offering breathtaking scenery, cosy pubs, small shop, bakery, cafe, watersports and horse riding in addition to the beautiful blue flag beach in Derrynane. Walking Trails Derrynane Coastal Circuit – 3 hours walk with a distance of 8km. This varied, low-level circuit explores sandy beaches, old mass paths and Derrynane National Historic Park. A great way to explore the beauty of Caherdaniel and Derrynane. MINIMUM BOOKING OF 7 NIGHTS. During july and august this is from Saturday – Saturday only. For all other months please contact the office 061 335799. From Shannon: Take N18 to Limerick, N20 to Adare, N21 to Castleisland, N23 to Farranfore, (In Farranfore village take right at petrol staion & follow Ring of Kerry road to Caherdaniel) – travelling through Glenbeigh, Caherciveen, Waterville & onto Caherdaniel. From Dublin : Take M7 from Dublin and take the Cork exit for the south. Take N7 for Limerick and follow directions as above or take N8 for Cork and follow directions as below From Cork Via N22 to Ballyvorney, R569 to Kenmare then N 70 (signposted Sneem). In Sneem follow N 70 to Caherdaniel. 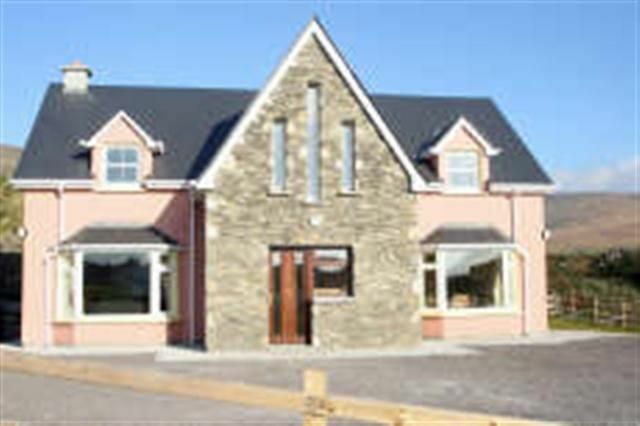 In Caherdaniel : Go through village and the houses are located on the right hand side opposite the school 200m after the cross roads in the village.